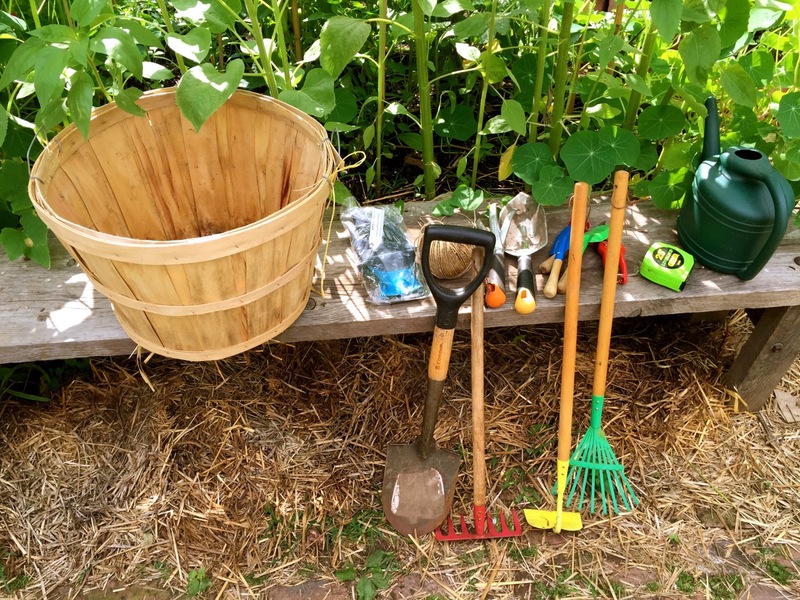 The Children’s Garden at Campos Community Garden just completed its FIFTH season of growing food, engaging the community and teaching and feeding kids from local schools, local youth organizations like the Boys Club, summer camps and group homes. As we have in seasons past, we hosted neighborhood kids, including campers from area summer programs, and produced a heck of a lot of delicious food. Find the tallest plant in the garden. Draw a picture of it in your notebook and name the plant. Pick 3 leaves that have different shapes. Glue or tape them into your notebook with the name of the plant. Find a leaf on the ground. Place it below and lay a square of tracing paper over the leaf. Rub it with a crayon or colored pencil (use any color you wish). Continue until you’ve rubbed over the entire leaf. Find each of these herbs in the garden. See if you can name them. Then, using your senses (sight, smell, taste, touch), describe three things about these plants as you experience them. Pick up a handful of garden waste (dead leaves, stems, etc.) and place them in the compost bin. With the help of licensed creative art therapist Gladys Cortez Feliciano, the children created incredible insects and decide what special power feature their insects have to help the garden grow. Campos Community Garden displayed their work as part of the the LUNGs Arts Festival on Sept. 23 and again as part of the School’s fall festival on October 15. This season culminated a couple of weeks ago with our very fun Garden Mystery basket program. Teams of third graders opened surprise bags of various combinations of produce and herbs that grow in our garden, and then working together, brainstormed, prepared, named and “styled” a dish designed not to feed themselves, but to feed the other teams. It was an amazing example of seed to plate, using almost every skill, including cooperation and teamwork, that a young person needs to develop into a self-sufficient, healthy and engaged citizen. The twist of this cooking class was that each team was not making something for themselves, but for the other team at their table. The vegetables in each bag were mostly raw and whole, but most of the teams got a version of a vegetable cooked in some way, such as roasted eggplant or sautéed Swiss chard. This gave the kids the opportunity to taste the same vegetable both ways and understand how their flavors differ upon cooking. Because it was mid-Fall, much of the actual produce in the Children’s Garden was past season. 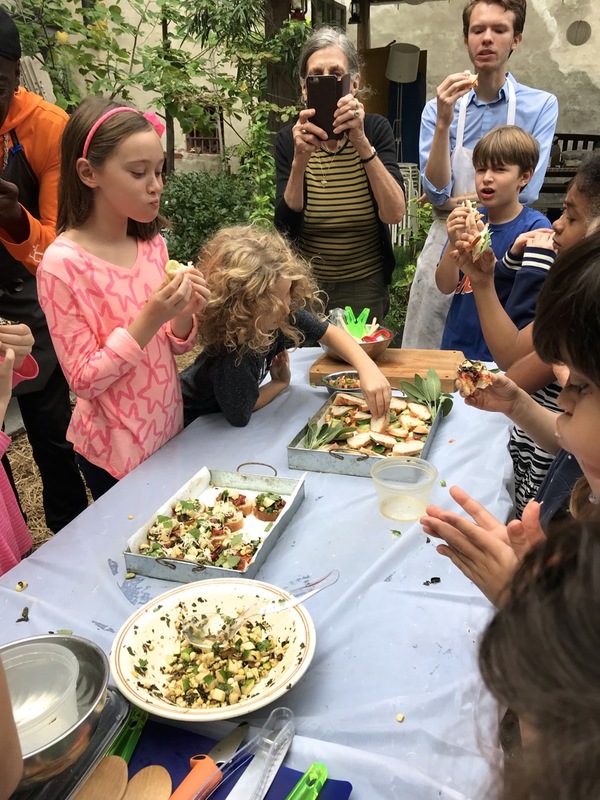 But with the help of East Village’s Gnocco Restaurant and Chef Gianluca Giovannetti, all of the vegetables we gave the kids were the same type we grew this summer in the garden. Thank you Chef!! The kids had about 40 minutes to decide amongst themselves what to make, and to divide up the tasks among the team members. Here’s a short video of Team Ant discussing what to make: Kids Prepping at Campos. After cleaning up their stations, each team presented their dish to the class as a whole, with its name, its ingredients and why they made it. They then gave it to their paired team, who also shared their dish. Then the tasting began. The reactions were almost universally ecstatic. The children discovered that healthy food like fruits and vegetables are delicious. Kids who never tasted vegetables loved the dishes that their classmates made for them, gave positive feedback and even compared some of the dishes to food they have seen on reality TV cooking shows. A few kids reported that they helped or wanted to start helping their parents prepare dinner. The program ended with a workshop focused on building awareness among the children on the different types of communities. The children reflected on their experiences in the garden by creating a team story which they performed for each other. This workshop was led by Linda Gelman, Master Storyteller and Producer, and a founding member of the legendary improvisation company, Chicago City Limits, located in New York City. Thank you to Garden Stories Leadership Workshops, Arts Loisaida, Children’s Workshop Garden and Citizen’s Community of New York City for their hard work, support, planning and partnership with NYC Foodscape to create this amazing program!